The information presented on this page was originally released on May 21, 2009. It may not be outdated, but please search our site for more current information. If you plan to quote or reference this information in a publication, please check with the Extension specialist or author before proceeding. Spring landscapes with azaleas, rhododendrons, dogwoods and redbuds look simply incredible. But as magnificent as these landscapes are, they are not complete without the addition of a Japanese maple with its lacy, fern-like foliage. These Japanese maples are from the dissected group, meaning they have leaves that are generally seven-lobed. The trees form a mushroom shape with twisting, gnarled branches. I read somewhere that you can expect a lace-leaf Japanese maple to reach the size, height and shape of a Volkswagen beetle. Many people think Japanese maples are for zones much farther north of us where winter temperatures almost always reach below zero. While they are cold hardy to 10-20 degrees below zero, they are well suited to the Southern landscape, as well. Brookhaven probably has more Japanese maples -- lace-leaf and otherwise -- than any other city in the state. They seem to thrive under the city’s high canopy of native hardwood trees. I recently spoke in Tallahassee and took a tour of the city. I was amazed to see so many Japanese maples thriving so close to what we might consider a coastal climate. If Tallahassee can do it, you know that we can grow them almost anywhere in Mississippi, too. The most popular varieties of the dissected, or lace-leaf, Japanese maples are Crimson Queen and Tamukeyama. These old varieties have stood the test of time, with Tamukeyama dating back to Japan in 1710. It performs better than most selections in the hot, humid summers of Mississippi and the Deep South. It also is one of the more vigorous varieties, reaching 6 to 8 feet tall after 10 years. Crimson Queen is known for its heat tolerance and ability to retain its deep red color during the summer. It will reach 4 to 5 feet tall after 10 years. That seems speedy compared to the popular Red Filigree Lace that only reaches 3 to 4 feet tall after 10 years. This is a great example of why Japanese maples are popular tub or container plants, giving an exotic Bonsai look. Local garden centers often carry both Garnet and Ever Red selections, which reach about the same height as Crimson Queen. The most popular green-leafed selection is Seiryu, which has dissected leaves and an upright habit reaching close to 12 feet after a decade. The great looking Japanese maples in Brookhaven and Tallahassee had a few things in common: high, filtered light; protection from wind; acidic, fertile, well-drained soil; and a good layer of mulch. 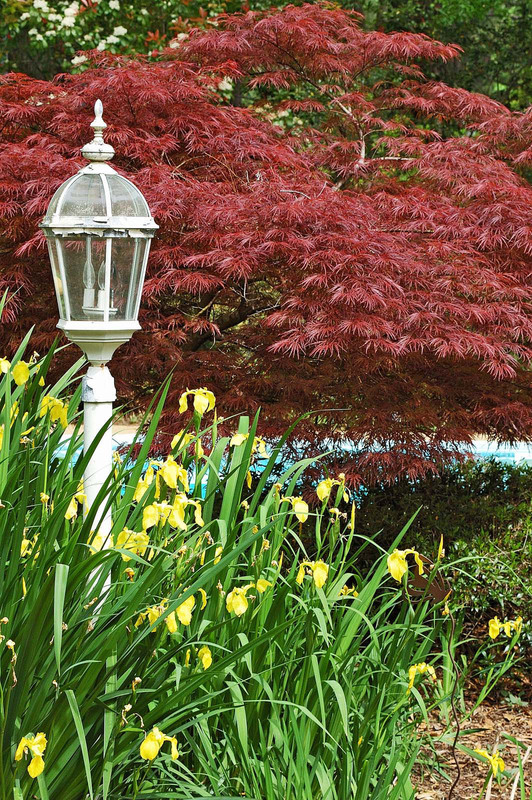 Japanese maples will be an enduring part of your landscape -- one of the more picturesque Japanese maples in Brookhaven has been there for 28 years. As yours grow and twist and develop that special character, you will be so thrilled you planted them. These maples will have special meaning for you and your children and grandchildren, who will mature along with the trees. Now is a great time to buy your lace-leaf Japanese maple while selections are greatest.